On this pilgrimage we run toward the open arms of the Father, receiving the promises given to us, His children, that through His grace our lives our transformed, as we give Him all our adoration! After Christ left the earth, He gave us the gift of the Holy Spirit (John 14:16). Now all Christians are anointed, chosen for a specific purpose in furthering God's Kingdom (1 John 2:20). "Now He who establishes us with you in Christ and has anointed us is God, who also has sealed us and given us the Spirit in our hearts as a guarantee" (2 Corinthians 1:21-22). Flight Manchester > Tel Aviv. Arrive to Ben Gurion Airport, Meet & assist with smile service after the passport control Meet the guide and transfer to hotel in Bethlehem. We begin our day with a visit to the Second Temple scale model for an overview of Jerusalem as it was at the time of Jesus. A short drive takes us to the village of Ein Karem, birthplace of John the Baptist, to visit the church that commemorates his memory. We then pray the Mystery of the Rosary on the walk up the hill to the Church of the Visitation. In the afternoon drive to Bethlehem to visit the Shepherds’ Field, commemorating the shepherds who minded their flocks as Mary and Joseph searched for lodging near Bethlehem. Then to Manger Square which stands in front of one of the oldest of Christian churches, the Church of the Nativity. Bending low, we enter the Church and descend into the Grotto of the Nativity. Leave hotel early to drive to Masada, site of the Jewish revolt against the Romans from 70—73 AD. Ascend by cable car to tour the excavations of the Unesco World Heritage Site. On the way back there is time for a swim (or rather a float!) in the mineral-rich waters of the Dead Sea, renowned for its healing properties. Continue to the oasis town of Jericho, the oldest city in the world and view Mt. Temptation, where Jesus fasted and was tempted by Satan, and see an example of Zacchaeus’ Sycamore Tree and Elijah’s Spring. End the day at Bethany where Jesus raised Lazarus from the dead. Dinner and overnight at your hotel. B, D.
Start the day on the Mount of Olives to take in the panoramic view of Jerusalem. 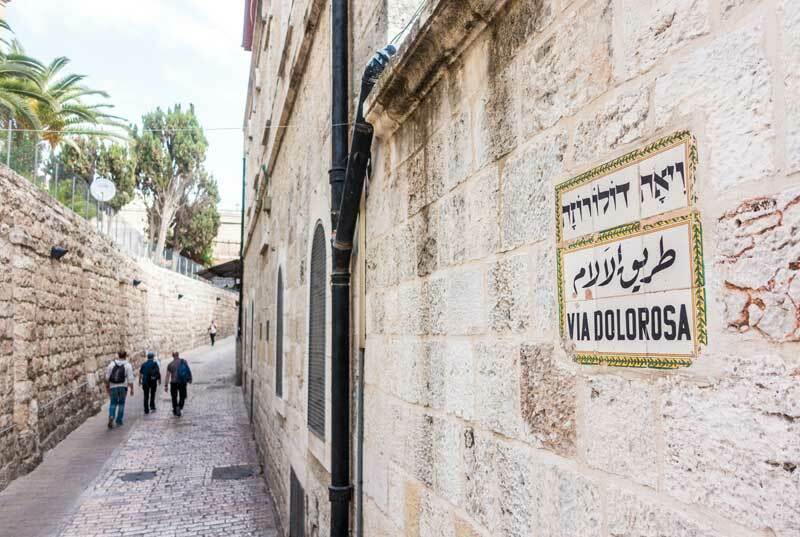 Visit the Church of the Pater Noster, which is built over the place where Jesus assembled His disciples and taught them the Pater Noster — The Lord’s Prayer. Walk down the “Palm Sunday Road” we visit the beautiful church, Dominus Flevit - “The Lord wept.” It was here that Jesus wept over Jerusalem [Luke 19:41] prior to His death. At Gethsemane we ponder Jesus’ final night. The Garden contains trees, the roots of which go back to the time of Jesus. We celebrate Holy Mass in the Church of All Nations and pray at the “Rock of Agony,” a section of bedrock identified as the place where Jesus prayed alone in the garden on the night of His arrest. Enjoy free time in Jerusalem later this afternoon. This morning, after a very early breakfast, we start the Way of the Cross at the Antonia Fortress, where Jesus was condemned to death by Pontius Pilate. From there He was taken through the city to be crucified. The Stations of the Cross lead us to the Church of the Holy Sepulchre, visit Calvary and the empty Tomb. We then walk through the Old City to see the Western Wall (Wailing Wall), the Jewish Quarter, the Cardo and the Bazaars of the Moslem and Armenian Quarters. Drive to Nazareth, the site of Mary’s home and the town where Jesus lived as a child. At Nazareth, , and visit the Byzantine Church of St. Joseph and Mary’s Well. Visit the convent of the Sisters of Nazareth where one of the nuns will give a tour of the fascinating excavations discovered there. In the afternoon visit Cana, where Jesus performed His first miracle at the request of His mother [John 2:1-11]. There visit the Franciscan chapel where those who wish to can perform the renewal of their wedding vows. 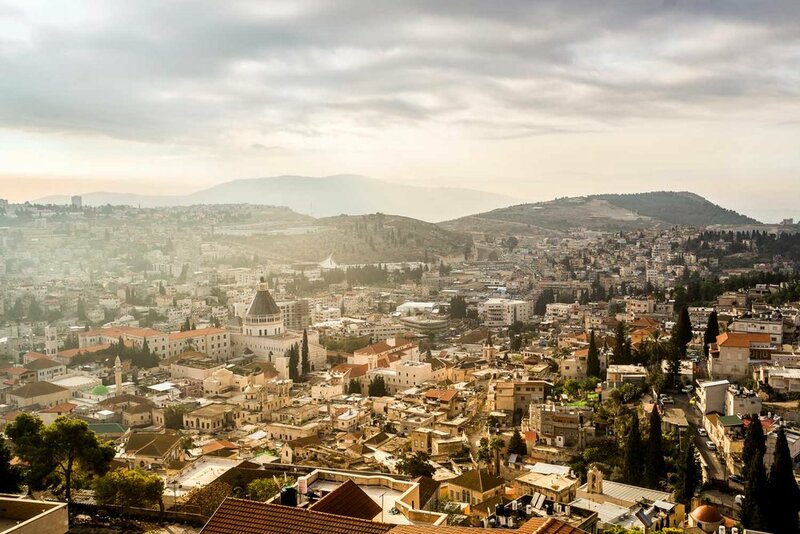 Drive to Mount Tabor, the site of the Transfiguration, with time to reflect on Christ’s Humanity and Divinity, good preparation for the journey to Jerusalem where Jesus was to suffer the crucifixion and resurrection, Continue to Tiberias to check – in to your hotel. The day starts at the Mount of Beatitudes, scene of Jesus’ great Sermon on the Mount. Then to Tabgha where Jesus fed the crowd of 5,000 and onto the site known as “Peter’s Primacy”. Here, after His resurrection, Jesus met with His disciples and told Peter to “feed my lambs; feed my sheep.” [John 21:9]. A short drive away is Capernaum, from where Jesus launched his Ministry; see the synagogue which dates to the time of Jesus and the church built over the site of Peter’s home. This morning after breakfast leave Mukhraka; the Monastery here commemorates Elijah confronting the prophets of Baal. Continue north to Haifa to visit Stella Maris, a Carmelite Monastery with the Madonna of Mt Carmel. After enjoying the view of the bay of Acco, head for Caesarea, which was once the ancient capital of the Roman province. Here you view the impressive archaeological remains of the Roman and Byzantine city that once dominated the region. It was at Caesarea that Peter came to understand that the Good News was not for Jews only, but for the whole world. Here he baptized the Roman Centurion, Cornelius, and his family. It was from Caesarea that Paul set sail for Rome, an event that eventually brought Christianity to the World. Early Dinner in Jaffa, transfer to airport. Flights are included in the package price but airport and timings will not be confirmed until later in 2019.